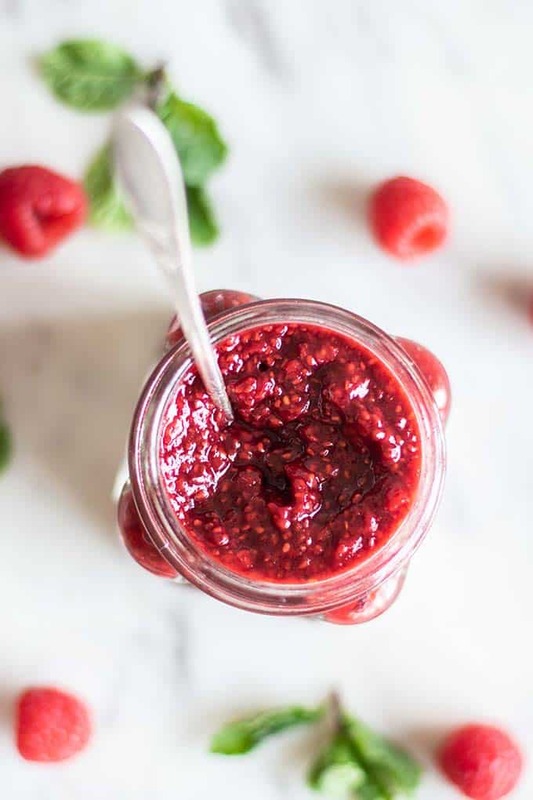 It’s easy to make homemade raspberry chia jam. This recipe is 100% fruit sweetened and makes a great spread, topping, or addition to desserts. Learn how to make sugar free chia jam with this easy recipe! 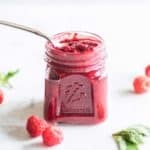 This is a vegan and paleo raspberry jam recipe. 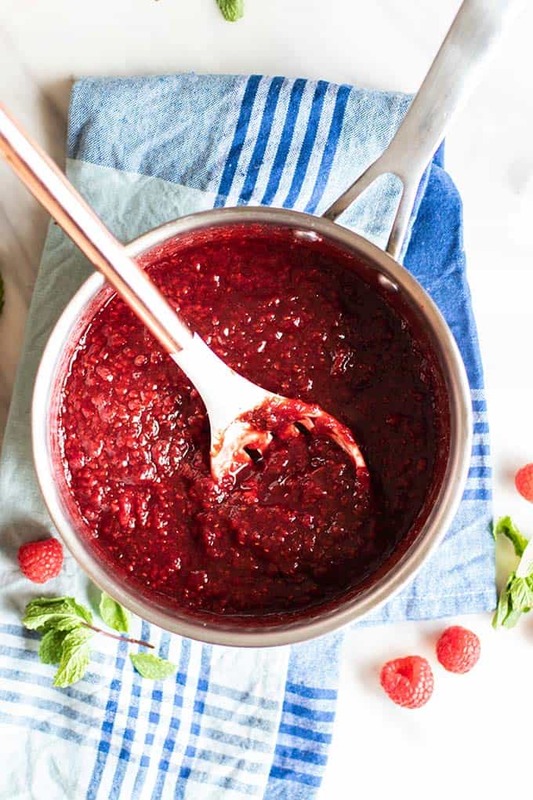 This homemade raspberry chia jam is the only jam I use in my kitchen. Making condiments at home, such as jam, gives you the ability to choose which ingredients you’d like to use. I make lots of “desserts” and sweet treats using 100% fruit — if you’re looking for healthy, fruit sweetened treats, you’ve come to the right place! While fruit is sugar, it’s more natural form is processed differently by the body. Fruit comes packaged with fiber and nutrients, giving it a lower glycemic index than processed sugars. Fruit jam is a great breakfast item, and a great addition to kids’ nut butter sandwiches, so why not make sure it’s made of health boosting ingredients rather than processed ones? Once you try making chia jam, you won’t go back. It’s too easy! Add frozen raspberries to a saucepan with water, and bring to a low simmer to thaw the raspberries. Scoop about 1/3 of the thawed raspberries into a blender along with some date paste. Process to combine. The date paste can also be mixed directly into the pan, but I like using the blender just to speed up the process of mashing some of the raspberries. Add the date sweetened mixture back to the pan, and remove from heat. Stir to fully mix the jam, and then add 2-4 tablespoons of chia seeds. Add jam to jars, and put the jar in the fridge. TIP: Why the large range of chia seed measurements? Because the absorption of chia seeds varies depending on brand and also age of chia seeds. Start with 2 tablespoons, and if your mixture isn’t as thick as you’d like it after about 10 minutes, add another tablespoon or two, and then allow it to thicken again. What if I don’t Have Date Paste? Date paste is easy to make. It’s just dates soaked in hot water, and then processed in the food processor or a high speed blender. It’s easier to make in a larger batch than what is needed for this recipe (easier to get the dates to process smooth). I like using date paste as a sweetener because in addition to the sweetness, all of the fiber from a whole fruit comes with it. If you don’t want to make date paste, maple syrup works here as well. Instead of blending the raspberries with the date paste, add the raspberries and the maple syrup to the pan (no water needed), and gently mash with a fork. 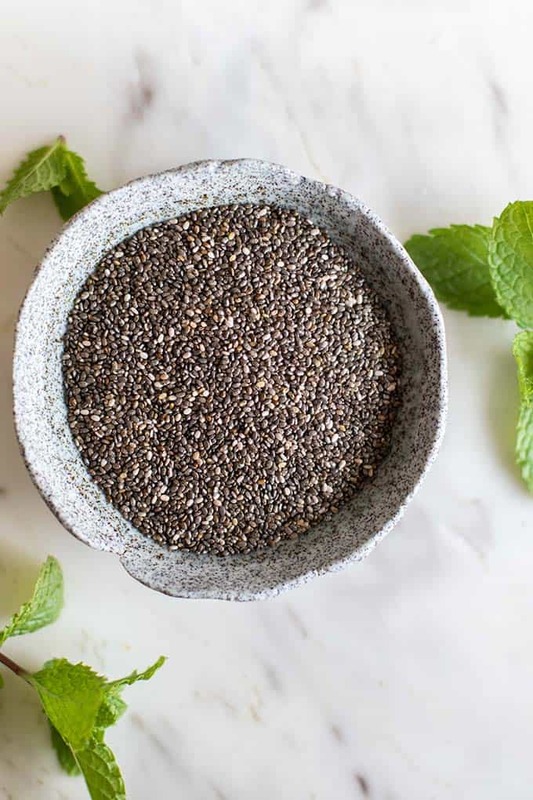 Why swap pectin for chia seeds? Pectin is a good thickener, but it doesn’t add to the nutrition of jam. Chia seeds are considered to be one of the healthiest foods on the planet. Full of fiber and Omega 3 fatty acids, they also have high levels of protein and calcium. 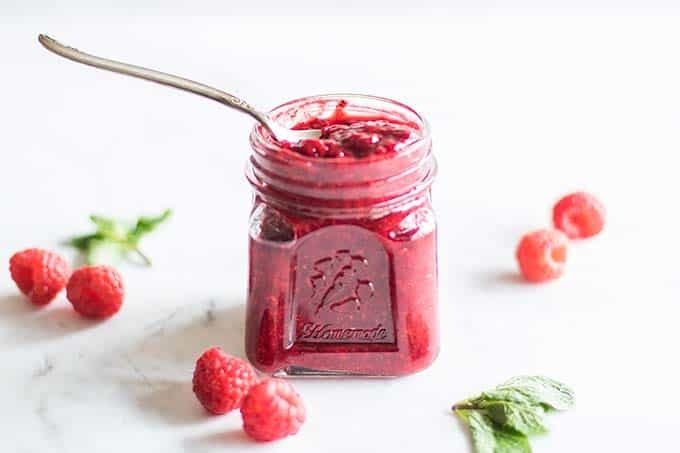 This easy raspberry jam recipe is a great way to incorporate more of these healthy seeds into your diet. Can I use Fresh Raspberries? Yes, you can certainly use fresh raspberries in this recipe. Fresh raspberries simply don’t last long in my house — they are so good for snacking! Where do I buy Chia Seeds? Chia seeds are a relatively common health food, available at many stores. If you check the health food section of your local supermarket, you’re almost guaranteed to find them. Large health food chains such as Whole Foods will also carry plenty of chia seed options. I often purchase items like chia seeds online. Try Amazon. I use Nutiva Organic Chia Seeds and also buy White Chia Seeds for fruit jams like peach. Can I make Raw Chia Jam? It’s simple to adapt this recipe to make raw chia jam. Instead of heating the berries in a saucepan, just keep the berries cool in a dish, and allow them to thaw. This recipe is perfect for raw jam because it uses a raw sweetener – dates. Omit the water and adjust the amount of chia seeds accordingly. My favorite chia seed jam is raspberry jam. It’s tart flavor makes it a perfect addition to many foods! Use this jam as a swap for a regular jam — on toast or muffins, or in a PB&J sandwich (great for kids!). Add a few tablespoons of raspberry chia jam to an olive oil & vinegar mixture to make a simple raspberry vinaigrette. 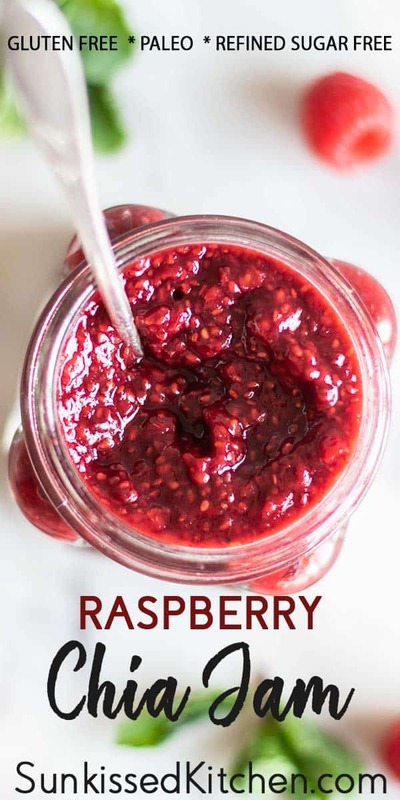 Top your yogurt, oatmeal, or chia seed pudding with this healthy raspberry jam. Use as a topping for baked brie to dress up your appetizer. 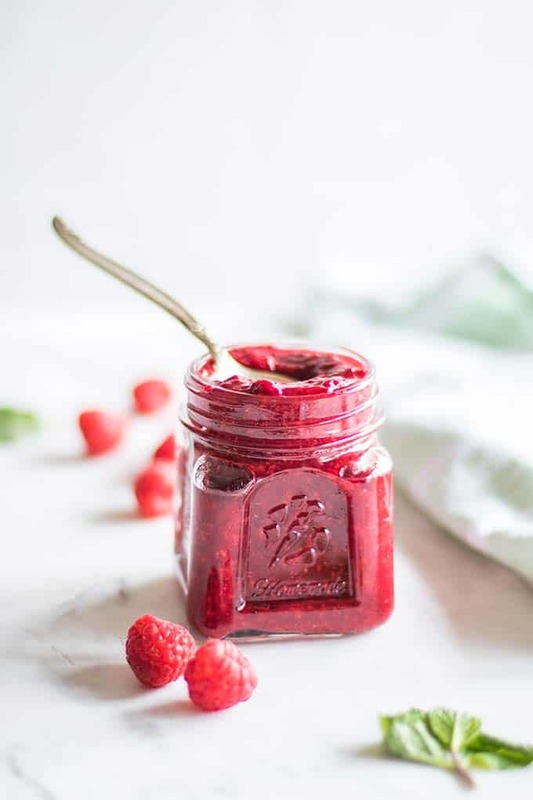 A healthy raspberry chia jam made with no added sugar! This jam is 100% fruit sweetened, and loaded with nutrients thanks to it's natural chia seed thickener. Add raspberries and water to a saucepan and bring to a low simmer over medium heat. Once the berries are fully thawed, scoop out about 1/3 of the berries and add them to a blender, along with date paste. Process to incorporate the berries and the date paste. Add the sweetened mixture back to the sauce pan, and remove from heat. Mix together the date sweetened raspberries with the rest of the raspberries. Start by adding 2 tablespoons of chia seeds, and stir to combine. Allow to thicken for about 10 minutes, and decide if you'd like your jam thicker. If it needs further thickening, add 1-2 tablespoons more chia seeds, stir to combine, and allow to sit another 10 minutes. 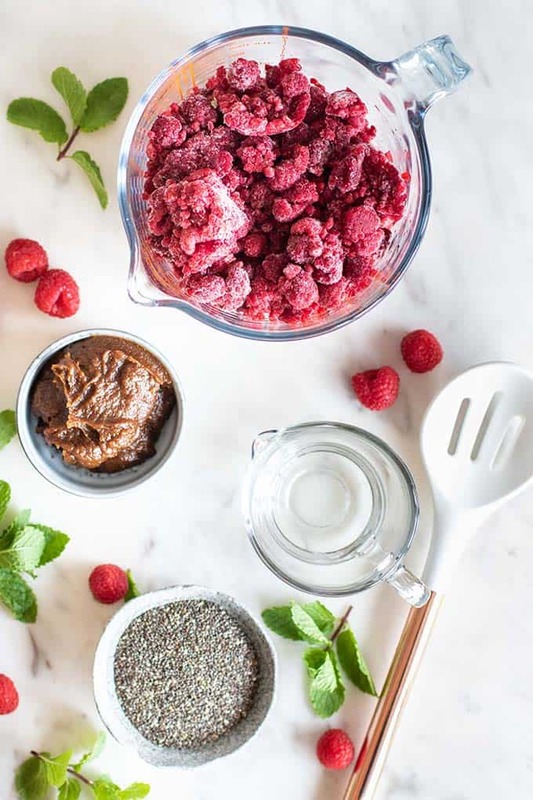 Raspberry Chia Jam can be store in the refrigerator for up to 2 weeks. It also freezes great for up to 3 months. *The absorbency of chia seeds varies depending on brand and age of chia seeds. It's best to start with a smaller amount of seeds, and add more based on desired thickness. Once you've made it once, you can record the amount you used and use that measurement for future reference. This Raspberry Chia Jam post may contain affiliate links, meaning if you make a purchase, I will receive part of the sale as a commission. This helps me continue to bring you lots of fresh and inspired recipes!